Put the potatoes in a pan and top up with cold water to just cover them (halve any larger ones to keep them all the same size or, if using regular potatoes, cut into quarters). Bring to the boil and simmer for about 10 min. Stick the tip of a paring knife or skewer to check if they are done. Meanwhile grate the lemon zest and juice the lemon. Wash and spin / dry the herbs. Drain the potatoes in a colander and when they are cool enough to handle, cut them into bite-sized pieces. Toss them in a large salad bowl with the lemon zest, juice, olive oil and crème frâiche. Add salt, pepper and grate in the horseradish to taste. 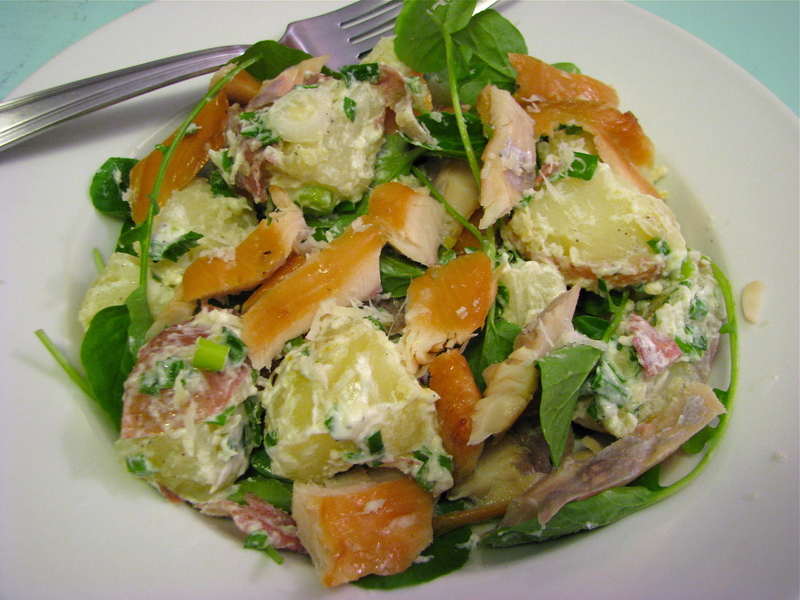 Chop the herbs and spring onions and add them to the potatoes, then tear up and add the smoked trout. I made this for lunch today – the picture below is a version I made a couple months ago where I also added some watercress. Next time I’m going to try it with some wild rocket.